Teucrium do well in sun to part shade depending on species, and are a dry tolerant plant. Members of the mint family all have fragrant foliage. Teucrium fruticans is the most widely grown species in Australia, however other varieties are worth considering. A group of drought tolerant small shrubs, they do make an excellent plant for low maintenance gardens. 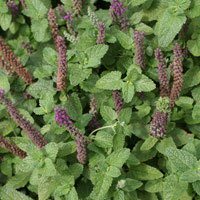 With purple to magenta flowers, on tall spikes Teucrium hircanicum is also known as the ‘Wood Sage’. Pictured right, Teucrium hircanicum makes an excellent in the garden border or used as an edging plant. Best in afternoon part shade in warmer climates. Teucrium chamaedrys commonly called Wall germander. This is a very different low growing form with ruffled leaves. New foliage is a ‘minty green’, and cream flowers in summer, reaching around 30cm it makes a great ground cover in shaded positions. Silvery aromatic foliage with pink flowers from spring through to summer also known as Cat Thyme..
Also known as the ‘ Silver Germander’ this is an evergreen with attractive grey stems and mid green foliage. Teucrium fruticans has small pale lilac blue flowers from late spring to summer. Useful as small hedge where it is easily pruned to shape. The toughest and most sun tolerant of the species Teucrium fruticans will happily grow to around 1.2m tall. Growing well in sandy soils and coping with coastal conditions once established, pruning is best carried out immediately after flowering. Plant at around 50cm to 1m apart for hedging. Ensure that drainage is good to prevent problems.